ESCALAB 250xi BASE SYSTEM WITH UPS AND XPS IMAGE MAPPING. XR4 Twin Anode Mg/Al (300/400W) X-Ray Source. - The surfaces of a corroding sample can be analysed. 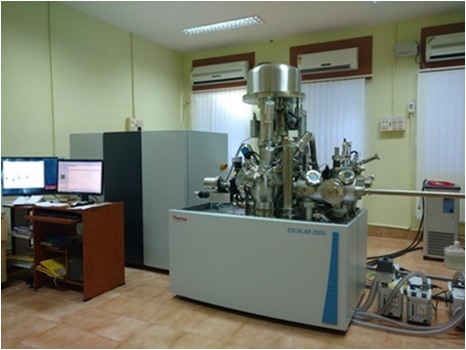 	The sample should not contain any volatile/degassing materials which will affect Ultra High vacuum in the analysis chamber (No out -gassing allowed). The samples may be preconditioned in Vacuum oven. 	Powders may be made into pellet or form a thin coating on a clean conducting substrate like silicon, aluminium or copper foil, if necessary. 	User should clearly mention if the sample needs etching (surface cleaning). It may be noted that the etching alter the chemical composition and chemical state to some extent. 	Sample containing high vapour pressure elements such as Na, K, S, P, F, Zn, Se, As, I, Te and Hg are not suitable for depth profile analysis. 	UPS is possible only on sufficiently conducting samples.